With postcard-perfect scenery, rare marine wildlife and a thriving culinary scene, there are plenty of reasons to add Victoria to your next west coast trip. Today, the old-meets-new capital of British Columbia on Vancouver Island (named one of the top 10 islands in the world by readers of Travel + Leisure in 2012) is experiencing a revitalization you won’t want to miss. And don’t forget: Victoria enjoys the mildest temperatures in Canada, making it an ideal, year-round travel destination. One of the world’s most beautiful harbours, Victoria’s inner harbour was once used by the First Nations and is now a hub of activity. But it’s not just a base for sightseeing, dining and downtown shopping – stroll the promenade surrounding it for one of the most picturesque views of the city against the backdrop of the parliament buildings. 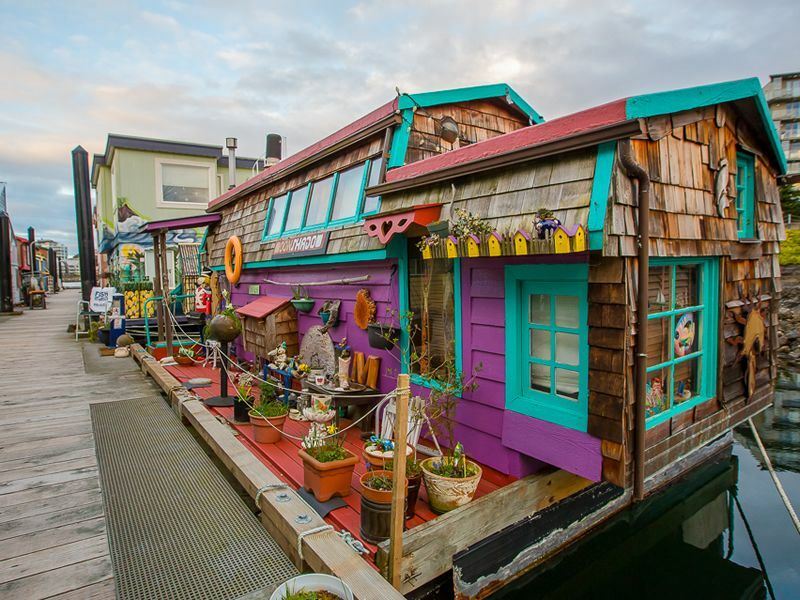 Just around the corner from the inner harbour you’ll find Fisherman’s Wharf, an enchanting village of food stalls, unique shops and colourful float homes cheerful enough to brighten even the cloudiest of days. While you’re here, you won’t want to miss the opportunity of a lifetime - orcas, Victoria’s famous wildlife residents, are abundant in these waters and Eagle Wing Tours, Canada’s first carbon-neutral whale watching company, will take you on an inspiring and educational adventure to witness their majesty. Then, just when you thought you’ve experienced all the beauty there is to see, the Butchart Gardens will captivate your senses. Condé Nast Traveller called it one of the world’s most beautiful gardens, and rightfully so. This massive attraction 30 minutes outside the city core will astonish you with its sheer scale, magnificent floral displays and exotic plants from around the world. Drive another 20 minutes for a tour of Sea Cider Farm & Ciderhouse, an organic, family-run cidery on the Saanich Peninsula. Sip on their award-winning craft ciders and snack on an artisan lunch plate in the tasting room while overlooking the organic apple orchard and sea. Of course, you’ll have the opportunity to buy your favourite cider by the bottle too. Before returning downtown, explore the Fort Rodd Hill and Fisgard Lighthouse to indulge your inner history buff. At these National Historic Sites, you’ll find a century-old artillery fortress once used by the British Navy and the oldest lighthouse on Canada’s west coast. You’ll be regaled by stories of its keepers while enjoying a view as impressive as the photogenic lighthouse, so don’t forget your camera! Taste your way through Victoria and you’ll see how the city’s once-modest culinary scene is reaching new, delicious heights. For both a farm - and sea-to-table experience, head to Café Brio, a contemporary, fine dining establishment with a focus on the best of Vancouver Island ingredients. Fresh-baked goods are showcased at the casual Willie’s Bakery & Café, but so too are mouthwatering, hearty all-day breakfasts. Dine here and you’ll also feed on history: located in one of the Victoria’s heritage buildings, Willie’s is British Columbia’s oldest bakery. Strapped for cash or pressed for time? La Taquisa serves up quick and budget-friendly burritos, quesadillas and tacos with house-made corn tortillas. Here, you can select your own fillings for your a custom-made Mexican meal just the way you like it. The Harbour Towers Hotel & Suites has it all: a location just steps from the inner harbour; modern amenities, including an indoor pool and hot tub; and complimentary buffet breakfast. For a few extra dollars, you’ll get a spectacular view of the inner harbour. How many hotels can boast its own marina? Situated in a residential area two blocks from Fisherman’s Wharf and walking distance to downtown, the Coast Harbourside Hotel & Marina will feel like home. Soak in the harbour view from your balcony and experience the award-winning cuisine in the restaurant, Blue Crab Bar & Grill - the best seafood spot in town. For unbeatable value, look no further than the Accent Inn, where the main attractions and inner harbour are just minutes away. Take advantage of the complimentary parking, wifi and its famously comfortable beds for a good night’s sleep. More information and to book: Holidays in Victoria are ideal for those seeking a relaxing getaway with scenic views and natural wonders or for creative spirits seeking a retreat from busy city life. Article written by Helen Suk.